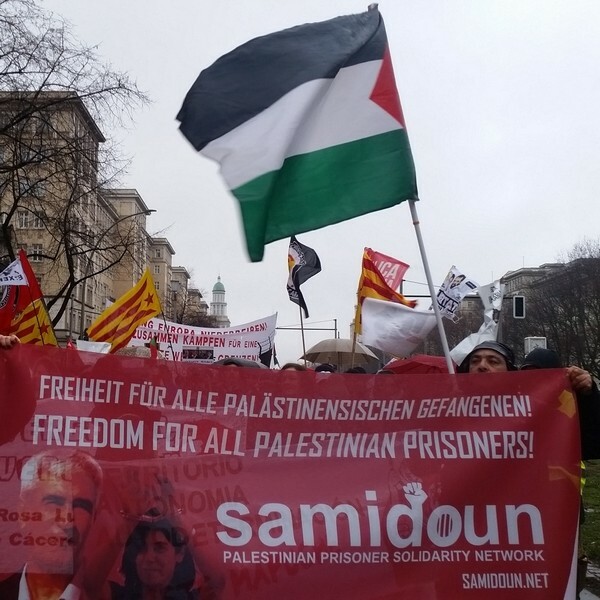 The International Week of Action to Free Ahmad Sa’adat kicked off in Berlin on Sunday, 13 January with the Palestinian contingent in the Liebknecht-Luxemburg-Lenin Demonstration as well as an evening event highlighting the struggle of Palestinian political prisoners. Samidoun Palestinian Prisoner Solidarity Network participated with other Palestinian and solidarity organizations in the morning’s demonstration, which brought over 10,000 people together not only to mourn the 100th anniversary of the assassination of Rosa Liebknecht and Karl Luxemburg, but to protest for revolutionary political change. The evening event featured guests from Coup Pour Coup 31, the anti-imperialist collective in Toulouse, France, that is a member of the Samidoun Palestinian Prisoner Solidarity Network. These activists are organizers with the Campaign to Free Georges Abdallah in France and have played a major role in popularizing his case and building the mobilization for his liberation. Organizers with Coup Pour Coup have visited with Georges Abdallah on many occasions in the prison of Lannemezan, where he is held. The statement from Coup Pour Coup 31 is reprinted below, in English. Georges Ibrahim Abdallah has been imprisoned for 34 years in France; despite being eligible for release since 1999, he has remained behind bars. The French government has refused his release, intervening at the highest levels to override judicial decisions for his parole. This has come hand in hand with pressure from the Israeli and U.S. governments, including interference by successive U.S. Secretaries of State, including Condoleeza Rice and Hillary Clinton. More recently, Lebanese President Michel Aoun expressed his interest in the case and securing Abdallah’s freedom; he is a Lebanese citizen who would return to Lebanon upon his release. For the first time since his imprisonment, the Lebanese ambassador to France visited him in prison. While these are indications that the growing campaign in Lebanon, France and internationally is having an effect, the organizers emphasized in their presentation that building the international campaign is critical to winning his liberation. Charlotte Kates, Samidoun international coordinator, spoke about the Week of Action to Free Ahmad Sa’adat, noting that events are taking place in many countries around the world, including Ireland, the United States, Canada, Argentina, Germany, Britain, Greece, Denmark and more. She also reviewed the case of Ahmad Sa’adat, the imprisoned General Secretary of the Popular Front for the Liberation of Palestine, and the reasons for the international mobilization for his freedom. She noted that this week of action is organizing to free all Palestinian prisoners, but highlights Sa’adat’s leadership as well as the international responsibility in his imprisonment. Sa’adat has been imprisoned since 2006 by the Israeli occupation; in March of that year, heavily armed occupation forces attacked the PA’s prison in Jericho, where he had been imprisoned by his comrades for the previous four years. They killed two Palestinian guards and injured many more in the process; Sa’adat is now serving a 30-year sentence for his role as General Secretary of the Popular Front for the Liberation of Palestine. He refused to participate in the Israeli military trial that convicted him, portions of which were observed by Kates as part of a legal/activist delegation to Palestine in 2007. In the context of security coordination, the PA arrested Sa’adat after tricking him into a meeting under false pretenses. With his comrades, he was transferred to Jericho prison, where he was held under U.S. and British guard. Some of the British guards stationed there had actually previously served to guard Irish Republican political prisoners in the North of Ireland prior to this assignment. Those U.S. and British guards moved away in a coordinated fashion to later allow for the Israeli assault and kidnapping. The event also included a presentation from a representative of the campaign to free Georges Abdallah in Berlin, who spoke about the challenges facing Palestinian organizing in Germany as well as the work being done to publicize Abdallah’s case and highlight why it is so important as the case of a prisoner of the Palestinian struggle in Europe. He also spoke about the importance of solidarity between struggles against repression, noting the Turkish and Kurdish political prisoners who have been jailed in Germany and elsewhere in Europe. The representative of ATIK, the Confederation of Workers from Turkey in Europe, spoke about their support for Georges Abdallah as well as the mutual solidarity they have received for these imprisoned activists. She noted that despite 34 years in prison, Abdallah continues to express his support for other political prisoners and work to demand their freedom. She also noted several of the cases of imprisoned Turkish and Kurdish activists who have been targeted for their role in organizing the community and supporting progressive causes in Turkey. Another activist involved in the campaign to free Mumia Abu-Jamal spoke about updates in the important case of the Black Liberation activist and journalist in Philadelphia who has also been imprisoned for over 34 years. There have been recent critical developments in the case, including a legal victory pointing towards the restoration of Abu Jamal’s appeal rights and the sudden discovery of six boxes of previously undisclosed evidence by the prosecutor’s office in Philadelphia. She reviewed the case and emphasized the need to connect across struggles to share solidarity, noting that Mumia himself has produced a number of articles and audio statements about Palestine and is a strong supporter of the Palestinian cause, leading to his case being known among Palestinians internationally. The presentations were followed by a lively discussion about the need for greater unity in the movement and the challenges faced in resisting repression in Germany and elsewhere. The event was attended and supported by activists and members of a number of organizations, including the Hirak Shebabi youth movement, the Democratic Palestine Committees, BDS Berlin, ATIK, FOR-Palestine and the Communist Party of Spain in addition to the Campaign to Free Georges Abdallah, the Campaign to Free Ahmad Sa’adat, Coup Pour Coup 31, the Free Mumia campaign and Samidoun, among others. We begin by warmly thanking the comrades of Samidoun and the Palestinian community of Berlin for this invitation. 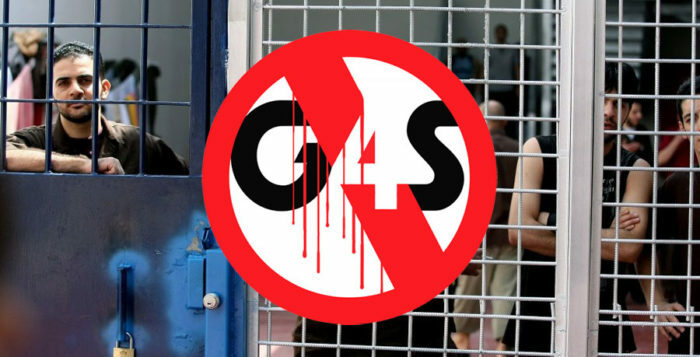 For us, it is very important to develop international solidarity, especially when it comes to fighting for Palestinian prisoners and Georges Abdallah. We would also like to extend the warmest greetings from Georges Abdallah to this event, which he had the opportunity to share with us during our last visit with him in prison. 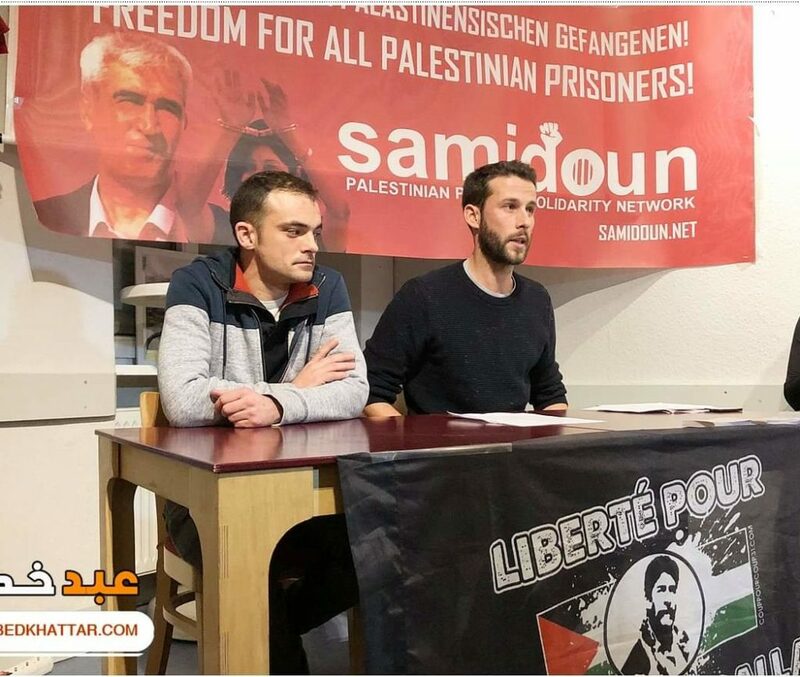 For 2 years, our anti-imperialist collective Coup Pour Coup 31 (based in Toulouse in the South of France) has joined Samidoun, the solidarity network with Palestinian prisoners. Our desire was to intensify our struggle and support for progressive and revolutionary Palestinian prisoners, at the forefront of the struggle against Zionism. To us, supporting Palestinian Prisoners also means supporting the only fighter for Palestine who is in French imperialist prisons, Georges Abdallah! Georges Abdallah is a political prisoner. Arrested in 1984 and sentenced to life in 198, following various political maneuvers, accused of complicity in the assassination of a Mossad and a CIA official on French territory. These were actions claimed by his organization, the Lebanese Revolutionary Armed Fraction. He has been eligible for release since 1999, but the French state refuses to release him. The US and Israel put pressure in this direction, and it is the successive French governments that keep him in prison, through various mechanisms. The French secret services are also involved in this ongoing process. Recently, Lebanese President Michel Aoun has declared his desire to release Georges Abdallah during French President Macron’s visit to Lebanon. A few weeks ago, Lebanon’s ambassador to France visited Georges Abdallah in prison. These are obviously positive signs that come as results of the international campaign and in particular the campaign in Lebanon. But only the intensification of the international campaign will free him. It is more than ever urgent to mobilize to compel the French state to do so. Georges Abdallah is an Arab communist. From his time in the Palestinian refugee camps in Lebanon, where he became politicized in the 1970s, Georges Abdallah never stopped fighting capitalism. This fighter has always affirmed his communist commitment, without ever denying it or denouncing his comrades. He still stands today alongside peoples struggling against imperialism, Zionism and reactionary regimes, as well as alongside proletarians in imperialist centers fighting for their liberation. He regularly makes statements of support for revolutionary political prisoners throughout the world, particularly in Morocco, Turkey, the Philippines … He has of course supported the various hunger strikes of Palestinian prisoners as well as Turkish prisoners. Recently, he has been supporting prisoners in ATIK, the Confederation of Turkish Workers in Europe, detained in Germany. Georges Abdallah is a prisoner of the Palestinian Resistance. He joined the ranks of the PFLP and fought Zionist colonization. His struggles, when he was free or once imprisoned, have always been a part of the struggle for the liberation of Palestine. Today, he expresses a vision that embodies the only just and lasting solution: a free and democratic Palestine from the sea to the Jordan and the return of all Palestinian refugees. Since 2009, we have been popularizing in Toulouse, France and elsewhere, the case of Georges Abdallah, his battles of yesterday and today. We continue to visit him regularly and correspond with the comrade behind bars. By fighting for his release, we are building links with Palestine, Lebanon and their freedom fighters. We are proud, for example, to have helped strengthen the ties between Georges Abdallah and the PFLP. In 2017, we proposed to Georges Abdallah to make a solidarity photo in support of Ahmad Saadat. In return, Ahmad Saadat made several statements in support of Georges. 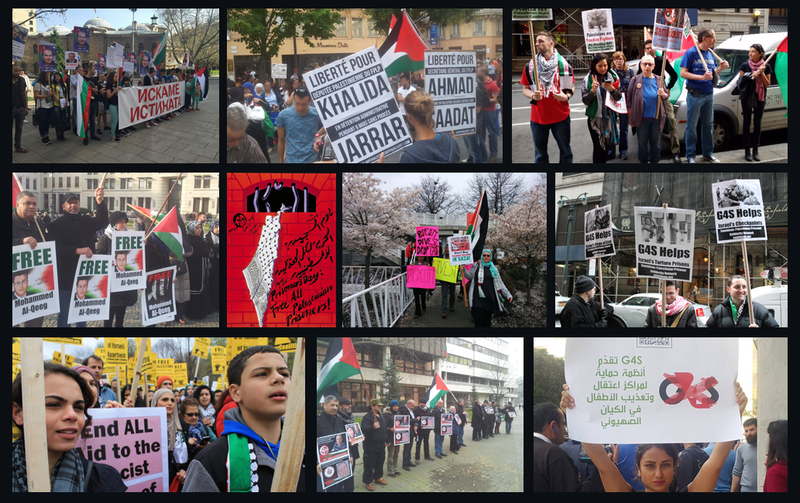 Today we come with an audio statement from George in solidarity with Ahmad Saadat. For us, anti-imperialist campaigners in Europe, it is very necessary to make the connection between Georges Abdallah and Ahmad Saadat. To make this link is to bridge the gap between the Palestinian Revolution and the revolutionary struggle here in Europe. This bridge also brings to light the support of the European imperialist countries for the Zionist entity, a support that we must fight by fighting our own imperialism. So let’s always continue to build and escalate international solidarity. Intensify the campaigns for the release of Ahmad Saadat, for the release of Georges Abdallah and for the liberation of Palestine, all Palestine, from the river to the sea.